Here's a quick look at the likely artwork for the It's Alive! box. It's not final, and might change over the weekend, but it's nearly there. As usual click on the picture to see a larger version. The first picture is the front of the box, the second shows the short side. What do you think? Better than the limited edition? Worse? I'm thinking of popping along to Summer StabCon in Stockport in just over a week's time with a few prototypes. Any one else going? Anyone been before? How many people go, is it worth me attending ? In other news it looks like It's Alive! will go to the printer early next week. I've been delayed because I need to put my address on the box apparently, and I wanted a PO Box instead of my home address. I've been playtesting like a man possessed over the last few days. Of the 58 submissions I've received, 12 prototypes are in process. Some of the rest I've turned down at one stage or another, others I'm waiting on the rules or a prototype from a designer. Of those twelve prototypes I've got, I've now played ten of them, with two still to hit the table. While Mal was here on the weekend, we played seven games of four different prototypes, Codenames: Backyard, Native, Rising (x4) and Carpe Astra. Monday night I went round to Paul's as usual, and as he was expecting a quiet night he asked me to bring some prototypes. We usually play 'real games' at Paul's games nights, so that was quite unusual. We played a couple, one that I'd played a few times solo and then with Mal, one for the first time. First we had a 3-player game of Backyard, followed by a 4-player game of Special, after Vin arrived. Both went down well. Last night I held another Tuesday night playtesting session at mine. Lisa and Paul G. made it, so we had another opportunity to play a game for at least 3-players. We played four different prototypes, one of which was the first play. Before Paul arrived, Lisa and I played a couple of games of Codename:Rising, she was keen to play it again after the first game (and so was Mal on Sunday) so that's got promise. We were just setting up Codename: Ancient when Paul arrived so we had a 3-player game of that. I really enjoyed this one - expect to hear more on that front! Next up was a 3-player game of Codename: Backyard. We finished off with a quick game of Codename: Match. Madness - I've only played this solo so far. and probably Carpe Astra too. Now that It's Alive! is nearly ready to go to the printers, I can split my time between trying to get distributors and shops to pick up It's Alive!, finishing off the rules for Carpe Astra and getting my submissions tested and evaluated. My mates Linz & Mal were down from Newcastle for the weekend for a belated birthday celebration. I don't often get to see the boys from Newcastle (who I used to work with when I lived there), although recently I've seen them quite a bit. It was a really good weekend, they arrived Friday night, and after a long catch up, and a great meal we played a game of Race for the Galaxy, before having to call it a night as we were all knackered. Saturday morning began after one of my legendary breakfast fry-ups, with a couple of games of the co-operative game Lord of the Rings. My copy doesn't see much action but I hang on to it, despite the lack of space, because I enjoy it and I don't have anything else like it. We played one game vanilla, and then one game with the Friends & Foes expansion. We were sorely crushed in both. Mal needed a break then, so Linz and I carried on. Linz was a Race convert, as we played it another three times 2-player, while The Wife and Mal went shopping. That evening we played some Carcassonne after Linz had left - still my favourite game. On Sunday, Mal and I mostly played prototypes. We managed to play four different games, one of which three times (there's a good sign - your playtesters wanting to play the game again). Today I'm back to work, and I've been working on the It's Alive! artwork again. The tiles idea looks like it's not going to fly, so we're back to similar components to the limited edition. Today I've sent most of the artwork to the printer, so they can check the formatting and print specifications, I'm due a further quote tonight and I hope to place the order officially tomorrow. I've still got the box to do, which is waiting on a photograph of a mock-up and a PO Box, apparently it's a requirement that I have my address printed on the box. I'm getting a PO Box rather than have my home address on the box. I should have the mock-up & photo done tomorrow or Wednesday, the PO Box registration should come through hopefully on Friday or Monday. Once, It's Alive! is in process I can go back to Carpe Astra and continue playtesting my submissions. I spoke to the Sales Manager at Carta Mundi this morning about a few things, including the tiles. He wasn't around yesterday, so with no input from him I started doing a different version of the artwork suitable for the tiles version, in case that ended up being cheaper. His first impressions about the tiles idea is that it wouldn't be cheaper. While all the components might fit on a print sheet (B1), apparently the press that does the die-cutting has a maximum die length, beyond which it cannot provide enough pressure to perform the cut. He thinks that all the components out of thick card might be too much in terms of die length for a single sheet (even if it will fit, which he doesn't know yet), so it might be that idea is dead in the water before it really got off the ground. He's spent today and is going to spend tomorrow investigating this and a few other ideas to see what turns out to be the most efficient method. I should hear back from him tomorrow afternoon with the results of his investigation, which will mean I can send the artwork to him on Monday. Hopefully it's only four weeks from then that'll I'll get something back in stock. I've spent today continuing with the tiles version artwork, just in case. Tomorrow I hope to finish the box and the tiles version. I've also got to clean the flat as I've friends coming down from Newcastle for a belated birthday celebration. I'd imagine I'll get some games in on the weekend, maybe even some prototypes. Last week I received a quote for It's Alive! It was a little high, but manageable. I asked my contact at the manufacturer what we could change to make it cheaper and he suggested a few things. We could move some things onto a sheet with others, make several components from the same material. It would reduce the amount of wastage and the number of printing plates required. Three days later I got the modified quote - 2 pence per game cheaper! If it's that little difference then I'll go with the original idea. I have had another idea though, it might save manufacturing costs, might not though, we'll have to see. I guess it'll be Monday before I see this third quote, and I should have everything finished by then so I can just make a decision and go for it. The new idea is to make all the components except the shields out of thick board: the slabs, players guides, coins and also the cards which will become tiles - like in Carcassonne. Apparently making the cards is very expensive because they are a non-standard size which requires re-calibrating all the machinery. Making them as tiles might be cheaper, or not significantly more expensive. What do you think? Would thicker components be better, or thin card ones like in the Limited Edition? At last! The end of this week has been extremely busy. I've had two main things to do: starting to drum up some interest/sales of It's Alive! in preparation for receiving the game from the manufacturers, and finishing the layout of the artwork in the correct program for the manufacturers. When I was getting the artwork digitally printed, the printer was happy to receive the artwork as uncompressed JPEG files. I used PaintShopPro to do these, painstakingly laying out all the components to pixel-perfect accuracy. Needless to say, it was a horrible and slow job. In particular, trying to justify the text for the rules was particularly bad as I had to move each word individually! Still, I had a copy of PaintShopPro and it almost did what I wanted. This time round the manufacturer wants PDF files, laid out in Adobe InDesign or Quark Express. I bit the bullet and bought a copy of InDesign for a staggering fee, but it has been well worth it. Unlike PaintShopPro it is specifically designed for print layout, and does a great job of it too. Clicking the 'Justify Text' button was a particularly great moment :-) I've laid each component out in it's own file, the cards one to a page, the rules, slabs, guides and coins with two pages - front and back. I've also started (but not yet finished) the new box design too. Perhaps the slowest job (and one I couldn't start until I received the last of the artwork yesterday) was doing the illustrations for the rules. These had to be done again, since there were some changes to the artwork, and so I had to reconstruct them from scratch in Photoshop (InDesign works best with artwork embedded as Photoshop .PSD files). That was finally done mid-afternoon today. So now I only have the box to finish off and it's ready to go to the printers. 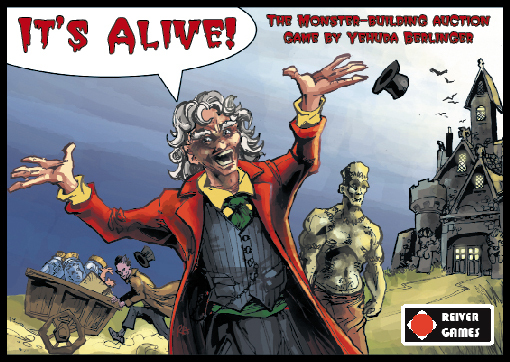 The other thing I've been doing is contacting shops in the UK, trying to convince them they need to stock It's Alive! I'm offering them the game in case quantities only (lots of six), if they want to get less I'm directing them to Esdevium, the UK distributors who have agreed to pick it up. I've already got far more orders than I've ever had for a game before it's ready, and I've not got any deals in place with US distributors yet. Nor any distributors in other territories. Next up is get the box artwork finished, and then trying to get other distributors and shops interested. I got to play one of yesterday's submissions solo yesterday a couple of times. I've been struggling to get some of the prototypes to the table recently, so I think soloing might be the way forward to get an initial feeling of the games. I need to spend more of my time testing my list of submissions. I've several which I've not yet played, and several I've not even scanned the rules for yet. In addition, I need to start thinking more seriously about the It's Alive! re-print. I've been contacted by several Americans who are really interested in It's Alive! but couldn't afford the combination of full-price game and airmail shipping from the UK. Getting the game made professionally means I can sell to US shops (and hopefully others too! ), meaning these customers will be able to get the game at a reasonable price. Either from a FLGS with no shipping, or from an online store which often offer discounted prices and free shipping for large orders. I've contacted a few US shops that contacted me last year, hoping to stock It's Alive! when I couldn't really afford to sell it to them, and a German distributor. The German market may be a possibility because the game components only feature numbers no language-dependent text, and I've decided to include German rules in the box this time. I've also had to do a few administrative tasks in the last couple of days. I've registered a bunch of barcodes, allowing me to place a unique barcode on the boxes of each of my games. It's an ongoing cost, but it allows me 1,000 barcodes, which I can use as I see fit. I've also VAT-registered which allows me to reclaim the VAT I pay on my purchases, and to sell to shops with VAT which is in their interest as they get to reclaim the VAT they pay on purchases from me. It's been another frustrating week so far, but hopefully things are looking up. Last Monday I was promised a quote for a re-print for It's Alive! in two days. I've been considering this as a quick way to get some money coming in, as the artwork is already mostly done, and it should be quicker both to manufacture (simpler components) and sell (known quantity). By the end of Monday, I still didn't have anything. So I emailed a few friends in the business to see if they knew of anyone else I could use in the UK. Dean Conrad of Ludorum Games offered to give our mutual contact at Cartamundi a swift kick up the rear, as he'd had good responses from him in the past. He texted me later to say I'd get a quote on Tuesday. By Wednesday lunchtime, there was still no word from Cartamundi, so I sent the guy an email, explaining how I was in a rush, it's no good promising quick manufacture if the quotes take ages to arrive, I had been hoping to work with them in the future, but I've lost all confidence in them now. A couple of hours later, the quote arrives :-) It's a bit high, but with a little wiggling I should be able to get it down to a manageable amount. The modified artwork is starting to trickle in, and I'm getting a German guy to translate the rules into Deutsch (thanks Michael). The rules guy is doing a great job, not only is he extremely quick, he's providing some really good feedback on the English rules. In other news, I've finally heard back from the English distributor, Esdevium Games, I'm hoping to speak to the Head Buyer tomorrow - he's seen my website, and he's interested. I also received a couple more prototypes today, a couple of quick card games, they look interesting, though I haven't had a chance to play them yet. I'm looking for a quick turn around on It's Alive!, I need some money coming in quick, once that's underway I can concentrate on finishing off Carpe Astra, and lining up the next game from the Reiver Games stable. It's going to be several months before Carpe Astra is ready as I've chosen a slower German company to do the manufacturing (they are a lot cheaper, which means I can sell it for less). The downside is that with It's Alive! sold out I have nothing left to sell. If I don't get something else out in the meantime, then I'm going to be without games income for several months. I've still got some money coming in from the Library (where I'm doing some consultancy), but it's not a huge amount (though it's for very few days). Also, my replacement started this week. I'll be required to do some induction training for him, but he'll be able to take over fairly shortly, at which point that source of income will dry up too. So, I've been thinking about ways to bridge the gap until the Carpe Astra is ready. One thing I considered was another hand-made run of something. I had a promising little abstract, but I don't think I'd be adding enough value to that by doing a hand-made edition, and of course, the unit price will be high doing a short run. The other thing I've been considering is a professional re-print of It's Alive! I think there's still a market for it (a couple of other publishers have registered an interested in it), especially in the US, where the combination of airmail shipping and the appalling exchange rate made the hand-made edition very expensive. The artwork is nearly ready. I'd change a couple of things for the second edition: I'm not entirely happy with the box illustration and the leg card is frequently mistaken for an arm, but other than that it's pretty much ready to go. I'd replace the wooden coins with card tokens, so Carta Mundi would be able to turn it around really quickly (three/four weeks). It's a known quantity. There's reviews, ratings and information about it. Customers want it. As a result it'll be easier to sell to shops/distributors than a brand-new unknown game. Once I've got my foot in the door it should be easier to sell Carpe Astra to them later. I'm just waiting on a quote (again!) to find out if it's viable. It's been a great month for me in some ways, not so good in others. As usual, I'll cover play first. It's the first month since I bought it that Race hasn't been my most played game, but in fairness, Carpe Astra has been undergoing rigorous playtesting, and I was demoing It's Alive! at a convention. In addition, to the games above the following were all played once: Agricola, Bohnanza, Fruit Fair, Guillotine, Gipsy King, Hansa, Masons, Metropolys, Monastery, Niagara, Null und Nichtig, Pickomino, Ra, Santiago, Scripts and Scribes and Stone Age. The following were new to me: Agricola, Bohnanza, Fruit Fair, Hansa, Ice Flow, Metropolys, Monastery, Null und Nichtig, Ra, Santiago, Scripts and Scribes, Stone Age and Tinners' Trail! Quite a haul. I also got two games this month, Dunk gave me Carcassonne: The City for being his best man, and I got a copy of Monastery as the second half of my swap with the Ragnar Brothers (Border Reivers and It's Alive! for Canal Mania and Monastery). My favourite new game is a tough call this month, maybe Ra, but with Ice Flow, Tinners' Trail, Agricola and Stone Age all in the running. Agricola was a bit disappointing, with all the hype surrounding it I was hoping for more, it's a very good game, but best thing ever? I'm not convinced. It's been a strange month for creation, my first full month of self-employment. I ran out of It's Alive! at Beer and Pretzels, and since then things went a bit weird. Having nothing to sell is nerve-wracking, I'm basically burning money now until I get some more stock of something. I've a little money coming in from my consulting at the Library, but not enough... Carpe Astra is proving troublesome, I'm still not entirely happy with it, and I waited months for a quote from Carta Mundi, only to find it much more expensive than LudoFact. So I'm going to have to go with LudoFact, which means it's going to be September at the earliest before I get any. That's three or four months without any income. Not an option. I'm investigating some other options to make sure I get some income sooner. It was great to sell out of It's Alive! within a year of the release at last year's Expo. There's still some interest in it (especially in the States, where the shipping costs and exchange rate put it out of many people's budgets). Re-printing it is a possibility if I think there's enough interest to warrant it. In the meantime, chatting to Paul from Games Lore I found out they still have two copies left in stock, so if you're after one best hurry! I've played Carpe Astra a lot this month, with various people. It's the first time I've playtested a game outside my gaming group before it was ready to go to print. It's lead to some mediocre ratings on the Geek which refer to an old version - hopefully they'll like the newer version more and update their ratings when then get a chance to play it. I'm still not 100% happy with the scoring mechanism - it keeps changing from week to week. Sooner or later I'm going to have to draw a line under it though - so I need to come up with something pretty quick. I had some interesting ideas from the playtesters at the Expo which I need to try out too. I've started to get a steady stream of other prototypes now too. I've not had a chance to play many of them yet, but there's definitely some potential in there. Probably the most promising so far is an abstract. I'm not sure whether that's a good idea though, as it would be something that is very easy to make yourself - is there enough value added in getting a nice edition in a box to warrant paying for it? I'm not sure. At least with a themed game you're paying for the artwork as well as the box and components, which makes it harder to knock-up a decent quality homemade version. I was at the UK Games Expo in Birmingham all weekend. I had a great time last year, releasing It's Alive! and selling out of Border Reivers. This year I had nothing to sell, so I didn't have a stand. Instead I was judging the UK Game of the Year award, networking with shops and distributors, playtesting and playing games. I'd played two of the eight games before the convention, and another three were ruled out on the day since they weren't available, which meant I had three to try out at the convention. I managed to play two of them on Saturday (twice each) and then the third Sunday morning. They were all good games, but Dean at Ludorum deserved his win for Ice Flow. It's a great game, simple enough that kids can play it, with enough strategy that adults get a kick out of it too. Plus, the artwork is by R H Aidley who did It's Alive! and will be doing Carpe Astra - so it looks great too. Tinners' Trail, the new Martin Wallace game was also very good. I met W. Eric Martin (Hi, Eric! ), the editor of Boardgame News, and played several games with him and his brother, including a couple of games of Carpe Astra and a prototype of Dominion which was really original. I'm sure with more plays, once I've got a strategy, I'll really enjoy it. It's a bit like Magic: The Gathering, but not collectible, and you build your deck as part of the game. Eric's agreed to playtest Carpe Astra some more, with some new features dreamed up during the games we played at the Expo. After playing until 1:30am on Saturday, I was wrecked when I got home last night, but I'm a bit more with it today. I'll be making some new bits for Carpe Astra today, to try out some of those new ideas mentioned above. In other news, I was interviewed by Jason Kong on Gamesizing.com recently, I keep forgetting to mention it. The interview was done via email over several weeks, hence referring to Carpe Astra by its working title of Codename: Network. Update: The Gamesizing interview has moved to: gamedesigners.wordpress.com.